How long do butterflies typically live? This is an interesting question. On recent visits to the reserve, the same Common Blue butterfly has been sighted on numerous occasions, usually in the same spot. We are pretty sure it is the same butterfly as it has a nick in it’s wings at a specific place and it seems to have been there for the best part of a month. One of the methods of determining the longevity of butterflies is the ‘Mark-Release-Recapture’ technique; butterflies captured in a net and given a unique number by a series of dots that are added to their underwings using paint or a special type of marker pen (see the featured image: 1-2-4-7 marking system; Ehrlich and Davidson, 1960). 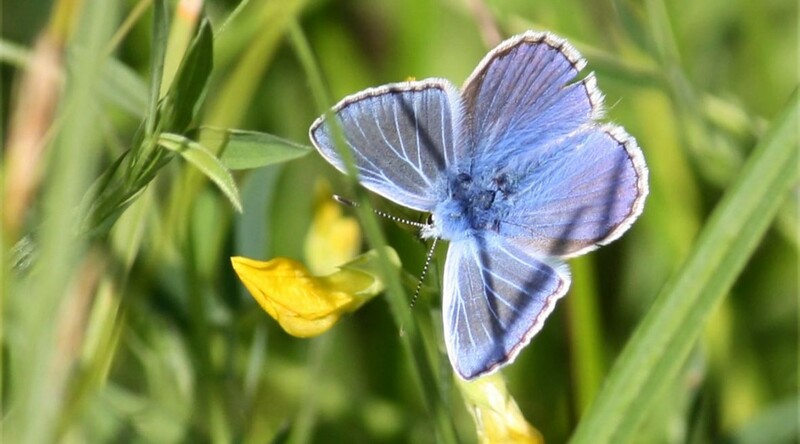 Like the nick in the wings of our Common Blue, it gives you a way of identifying an individual and if enough are marked it is possible to build up sufficient information to create an estimate of longevity. If the same individual is recaptured at a later date the days that have elapsed between it’s marking date and the last capture date can be recorded. This technique can also be used for studying dispersal of butterflies (their flight characteristics). On studying a colony of Silver Studded Blue butterflies in North Wales the longest period between first and last captures I found was 26 days, for a female. The average period between first and last captures was just over 3 days. Maybe one day we will be able to fit tiny tracking devices to butterflies but for the moment this is still a commonly used technique. How longevity varies between species is another question, but our Common Blue is still there after a month and it is looking in surprisingly good condition! After our work party, on the 11th July, we were wondering whether the White Letter Hairtreaks had emerged yet, but the following day confirmed they are back in good numbers. They still seem to like to sit on the Creeping Thistles, down near the drainage ditch (near the bench), but have also been sighted near the other end of the site, quite close to the entrance at times. 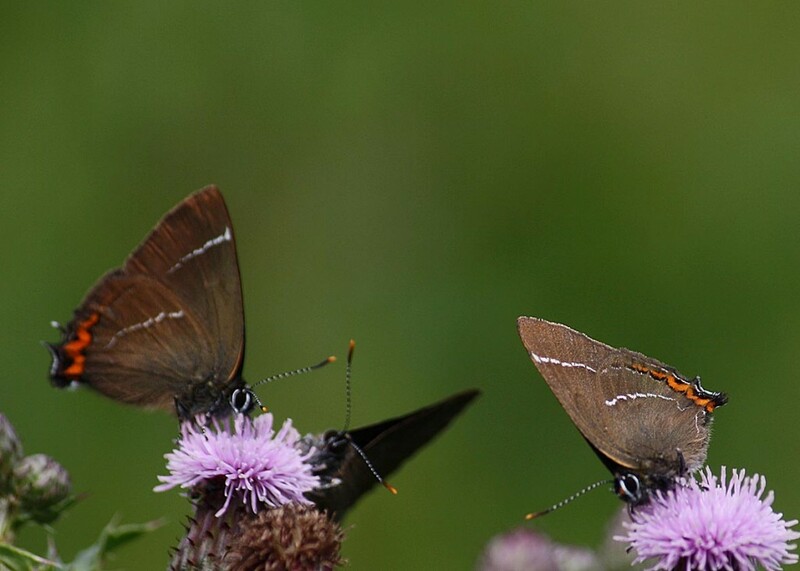 As well as Creeping Thistle, they have been spotted sitting on Ragwort and nettles. An elm tree, by the metal gate, seems to be the food plant of the larvae, on the first lawn. We have noticed what we thought was Common Birdsfoot Trefoil (Lotus corniculatus) at the site and were hoping this could spark a resurgence of Common Blue butterflies. 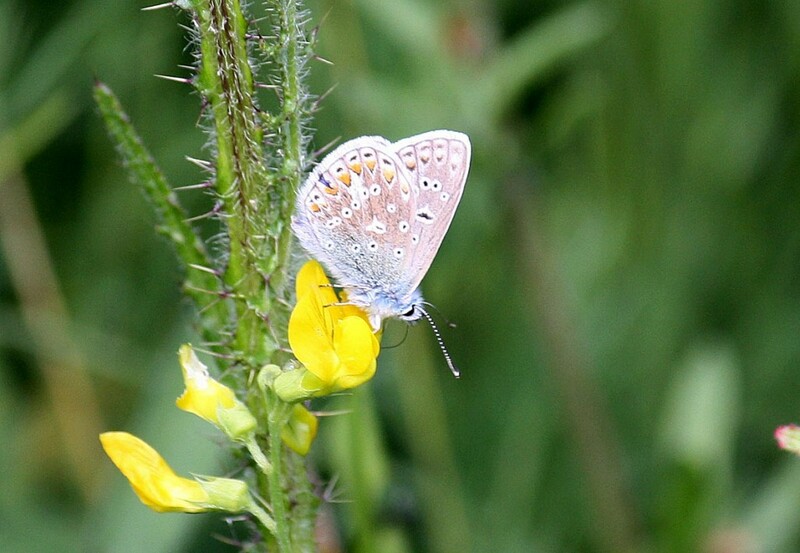 On a recent visit by the Bradford botany group, the Common Blue in this picture was actually found on Meadow Vetchling (Lathyrus pratensis), also known as Meadow Pea. Other plants, used by the Common Blue include: Greater Bird’s-foot-trefoil (L. pedunculatus), Black Medick (Medicago lupulina), Common Restharrow (Ononis repens), White Clover (Trifolium repens) and Lesser Trefoil (T. dubium). We are hoping to receive a species list from the botanist’s visit so hopefully this will give us some more information.